Ten years ago this month, the world met Walter White, the chemistry teacher with a terminal cancer diagnosis whose meteoric rise in the drug trade and precipitous fall from grace were traced in one of the defining TV dramas of its era. It’s Breaking Bad’s 10th anniversary, which also means that creator Vince Gilligan has spent a decade (give or take hiatuses and development processes) telling the stories of Albuquerque, New Mexico’s most morally compromised, colorfully criminal, complicatedly complicit. After Walt came Jimmy McGill, the ethically flexible attorney who Bob Odenkirk played on Breaking Bad under a different name: Saul Goodman. Now in production on its fourth season, the prequel Better Call Saul contributes to and draws upon the legacy of Breaking Bad, while pulling the rare spin-off feat of both establishing its own identity—a little more humor, a little more patience in the storytelling—and occasionally outmatching its predecessor. Following the Blu-ray and DVD release of Better Call Saul’s third season, The A.V. Club spoke to Gilligan about bringing Giancarlo Esposito back to Los Pollos Hermanos, the fate of Chuck McGill, and getting the show’s cast the awards recognition they deserve. The A.V. Club: We’re talking the day after the Screen Actor Guild Awards, where Bob Odenkirk was nominated for Outstanding Performance by a male actor in a drama series, but didn’t win; he’s been nominated in the Emmy and Golden Globes categories for all three seasons of Better Call Saul, but hasn’t won there, either. What’s it going to take for him to get one of these awards? Vince Gilligan: I’m usually a glass-half-empty guy as I slog through life, but I think this is nothing but heartening. They used to call this a Golden Age of television, and now I think it’s being rebranded as the Platinum Age—David Bianculli, I think, was the fellow who coined that phrase. I buy into it. There’s just so much good television on: So many great shows, so many great actors in these shows, and the competition is so fierce. Listen, I’m biased as hell. I’d love to see him win, I would think that would indicate that all was right with the world. But the fact that he’s in the running, he himself—not to speak for him—would say “It’s an honor just to be nominated.” That’s an old saw in terms of expressions. But when we first started getting nominated for Emmys for Breaking Bad, I suddenly saw the truth to that cliché. It is an honor, it really is wonderful to be in the running. I’m hoping he’ll win before it’s over. And god knows—I think he would agree with this statement as well—what I really want to see is Rhea Seehorn get nominated for the fantastic job she does. And we’re all sad that Michael McKean didn’t get more love for that magnificent portrayal he gave of Charles McGill. But that’s not why any of these folks do it, it’s not why I do it, but it is a wonderful cherry on top when it does come. And you never know when it is going to come, but it’s great to be in the conversation. AVC: You speak of Michael McKean’s performance in the past tense—does that confirm that we’ve seen the last of Chuck McGill in the present tense? VG: Here’s the beauty—well, [Laughs.] you phrased that very well. As any fan of Breaking Bad or Better Call Saul knows, with our chronologically elastic form of storytelling that we employ, it’s very possible to see characters who are dead in the present or long since deceased. You just never know when someone’s going to pop up again. Very possible, we’ll see Charles McGill again. 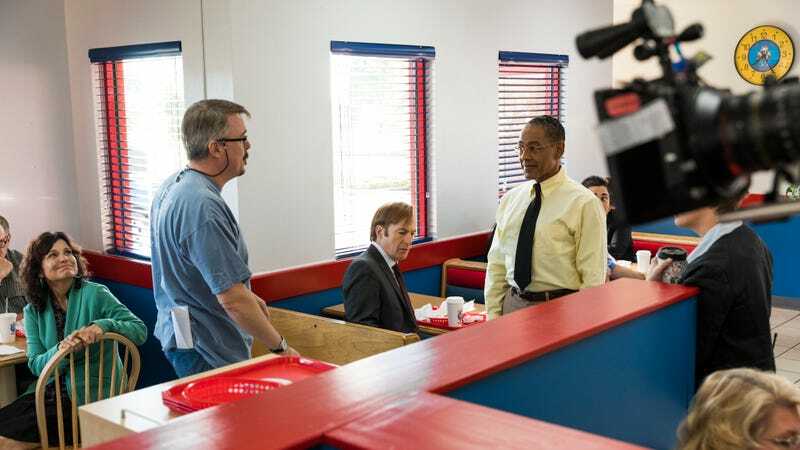 AVC: Introducing Gustavo Fring into Better Call Saul is a big step—it’s a landmark in the timeline of the story you’re telling across two whole TV shows. What about season three made it feel like the right time to reintroduce him? And what was it like to see Giancarlo Esposito re-inhabit that role? VG: To answer the second part first: I had the good fortune and pleasure of getting to direct Giancarlo in that first couple of episodes of season three. The whole crew, many of whom were on Breaking Bad as crew members, [they were] so excited to see him again. He’s just the sweetest guy in the world, he has the most wonderful smile. He’s a hugger. So great seeing him saying “hi” to the crew, shaking hands and posing for pictures. It was so great having back in the family—though, once you’re in the family, it’s like the mafia: You’re always in the family. And then he turns it on, and suddenly he’s not this warm, sweet guy—he’s ice cold. And he is Gustavo Fring. He turns it on like a light switch. He’s such a pro. It’s the same way Bryan Cranston would do it. I remember one time watching Bryan Cranston just bullshitting about baseball with one of our grips, and the assistant director says “Roll camera.” [As Cranston.] “Yeah, I think the Yankees, I don’t, blah blah blah blah blah.” [As director.] “Action!” Boom: He’s Walter White. It’d make your head spin. How do you do that? In terms of the first part of the question: How did we know to bring him back when we did? We didn’t, is the short answer. We are greedy, we want to see all these people—up to and certainly last but not least, Walter White himself. Hopefully someday we’ll get to that—I’ll have to be coy about when that may be. But also, sometimes we just don’t know. We’re feeling our way through it. We’re taking it a day at a time in the writers’ room. Part of us, it’s like you want to eat your dessert first: You want to get greedy and get to all the good stuff as quickly as possible. But sometimes you have to exhibit a fair amount of self-discipline, and hold off these wonderful treats for the audience. Because, sometimes, that makes for a much more satisfying experience: making you wait for Gustavo Fring, making you wait for this character or that character. Sometimes, opportunities don’t present themselves in terms of plot as readily as you might hope, so sometimes you hold off bringing the character back for those reasons. The best way to do this is to tell the stories as organically as possible, and let the situations and the plot, as it unfolds, dictate to the writer when, if ever, a certain character should make an appearance or a re-appearance. You let the story tell you when to bring them back, not the other way around. AVC: Giancarlo’s return to the show was heralded by those online Los Pollos Hermanos training videos—where do those types of bonus materials originate? Do they come out of the writers’ room, or is it something that’s handled by AMC? VG: In a sense, that came out of the writers’ room. Our wonderful writers’ assistant, Ariel Levine, wrote the script for the training videos. She did a marvelous job—I’m just so proud of her. I knew next to nothing about that as it was going on. Suddenly, they say, “Hey, look at this!” And they’re showing me this thing. I just thought it was brilliant. She’s got a real future ahead of her, as do all the young folks who work in our office. We’ve got these great, talented people who write stuff, or even direct stuff, when the possibility arises. My assistant, Jenn Carroll, directed an internet video with the Kettleman’s—it’s a wonderful short film, essentially, about the family from season one having a picnic by the side of the road, as a pretense to spend a little time with the patriarch, Mr. Kettleman, who’s on work release and prison. It’s a great way to give them some experience so they can then eventually step into the shoes of writers and directors on the show. AVC: In addition to providing those opportunities to people working on the show, does it feel like an opportunity to build out the world of Better Call Saul? VG: It’s another tool in the toolbox. There’s so many different names for them. When we started on season one of Breaking Bad, we called them “minisodes,” and then they became known as “webisodes,” and then I don’t even know what the hell to call them anymore. They’re a great opportunity, but it’s kind of a double-edged sword, because if you’re doing the job right, the most important part of the job is breaking the actual, canonical episodes. The real reason we’re all here is to make 10 or 13 or however many episodes a season. That job typically is all hands on deck, and takes every bit of time and every bit of effort and every dollar that we have at our disposal. Getting that stuff right is paramount. The hell with the rest of it—if any ancillary idea or project takes one iota of attention away from the main job at hand. That’s the way I historically thought of it. “At the end of the day, I don’t have any energy to read—or write, god knows—some side project, little five-minute thing.” But then it dawned on us: We’ve got these wonderful young women and men on our staff, in support positions and assistant positions who are really, really smart and are really passionate about furthering these stories. [Laughs.] And they’ve got more energy than I do, that’s for sure. And they are happy to write these things. None of us—none of them, either—would let the main task at hand suffer, but we realized we can do both. AVC: One of the more startling moments of season three is Kim’s car crash, which is startling in part because traffic accidents have become such a familiar shock tactic on TV. In this case, the “accident” part happens entirely off-screen—Kim’s driving, there’s an abrupt cut, and her car has gone off-road and smashed into a boulder. Can you talk about how that decision was made? Was there an effort being made to avoid cliché? VG: I had stepped away a little bit at the end of last season, so I don’t know who came up with that. I’d love to take credit for it [Laughs.] but I know it wasn’t me. It may well have been Minkie Spiro, our director for that episode, who’s just great. It was probably an idea she came up with in concert with the writers. I thought that was marvelous, myself, as one of the first fans of the show. I agree with you: That was shocking the way that was done. That was a great bit of visual invention. It took me by surprise when I first saw it. That’s the whole name of the game, really. Philosophically, that’s something we’ve hewn to and worked toward for 10 years now. Saying, “How would a scene like this usually be covered? Is there another place to put the camera? Is there another way to do this?” It gets harder and harder to shock the audience nowadays. We’re all of us working harder than ever to do just that. AVC: Knowing that you have to be coy about season four: Can you tell us about any themes you might be writing toward for the new season? VG: Every year gets us closer to Jimmy McGill becoming Saul Goodman, and this year will be no different. The worlds of Jimmy and Saul are coming together, and therefore it stands to reason the worlds of Better Call Saul and Breaking Bad are overlapping deeper and deeper into one another as well. Thematically? It’s not a great answer, but it’s the truth: The thing we always found, going back to the earliest days of the show, is that sometimes we let the audience figure out the themes for us. I often think they’re better equipped to do it. On our best days, we let the characters tell us where they’re headed, and on the very best days, we writers feel like stenographers: We’re taking down what these characters are doing and where they’re going. They’re leading us around, instead of the reverse. And when you’re deep into it, trying to figure out to follow these characters and follow their hearts and tell their stories, theme becomes something that’s on too macro a scale to be readily recognized. In other words, you can’t see the forest for the trees. But I can tell you, again as a fan, there’s some fascinating stuff coming. The show gets darker this season. I think it’s still going to have moments of humor and those fun Saul Goodman/Jimmy McGill moments—I don’t know that they’ll ever go away completely. But as you would expect from the end of season three, Jimmy’s in for quite an emotional ride.